श्री स्कंद (कुमार कार्तिकेय) की माता होने के कारण ही इनका नाम स्कंदमाता पड़ा है. नवरात्री के पांचवे दिन इनकी पूजा करने का विधान है. इनके विषय में ऐसी मान्यता है कि जब पृथ्वी प्र असुरों का अत्याचार बहुत अधिक बढ़ गया था तब स्कंदमाता ने अपने संत जनों की रक्षा के लिए सिंह पर सवार होकर दुष्ट दानवों का संहार किया था. Navratri is celebrated with a great deal of enthusiasm in every part of India. Navratri i.e. 9 nights is a 9 day long celebration with each day holding a distinct significance. It is a festival dedicated to Goddess Durga and her nine forms. Each day is associated with one form of Maa Durga. 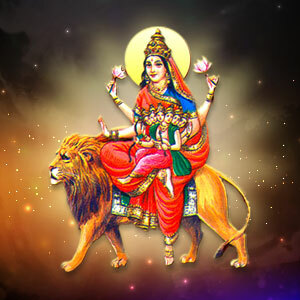 The fifth day of Navratra celebrations is dedicated to Maa Skandmaataa. ‘Skanda Mata’ is considered as the fifth aspect of Mother Durga. Skanda Mata is the mother of Lord Kartikeya or Skanda who was picked out by the Gods as their commander in the battle against the demons. Fifth day of the Navratri is dedicated to Skanda Mata. She is accompanied by Lord Skanda in the figure of an infant. She rides a Lion and takes her son Skanda in her lap. She is said to have three eyes and four hands; two hands displays granting and defending Mudras while the other two holds lotuses. She is worshipped to achieve salvation, power & prosperity. On the fifth day of Navratris, the puja begins with setting up idol of Maa SkandMata. Purify with Ganga Jal or Gaumutr. Do Kalash sthapna by placing coconut on the water-filled pot of Silver, Copper or Earth. Now, take the Sankalpa for Puja and vrat, then do shodopchar puja of Maa SkandMata alongwith all established deities with Vedic and Saptshati mantras. Then offer all relevant pujan samagri to all the deities. Finally do Aarti and distribute Prasad.